Can't see the Flash Panel of our Products above. Click Zazzle Stars Cafe and go directly to our shop!. and further support & benefit our Zazzle Artists and their Art! Do you know a Zazzler that deserves some recognition! Are you A Dazzling Zazzling Star in your own right! 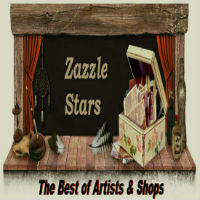 you are proud to Dazzle Your Zazzle and support other artists who do too!